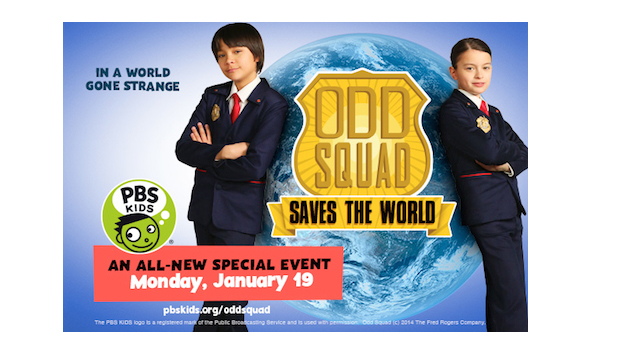 Arlington, VA, December 18, 2014 – On Monday, January 19,PBS KIDS will premiere a one-hour special from its newest media property,ODD SQUAD, a live-action series designed to help kids 5-8 build math and collaboration skills. In “Odd Squad Saves the World,” kid agents tackle high-stakes cases and work together to overcome obstacles and save the day. Clips and full segments from “Odd Squad Saves the World” will also be available on pbskids.org, the PBS KIDS Video App and PBS KIDS on Roku, Apple TV, Chromecast and Amazon Fire. New episodes from the series will also premiere throughout the week of January 19. ODD SQUAD focuses on two young agents, Olive and Otto, who are part of Odd Squad, an agency whose mission is to investigate unusual occurrences. A math concept is embedded in each of their cases, as Olive and Otto work together to problem-solve and set things right. ODD SQUAD premiered on PBS KIDS in November 2014 and airs weekdays on PBS stations (check local listings). The ODD SQUAD website, pbskids.org/oddsquad, offers a variety of engaging games, activities and videos for kids, as well as parent and caregiver resources. New games and activities will be released to coincide with the “Odd Squad Saves the World” broadcast premiere. Children can also sign up to become Odd Squad agents online and earn rewards as they play math games inspired by the series. Sinking Ship Entertainment is an award-winning production and interactive company that creates and produces groundbreaking kids TV and transmedia content. Since its founding in 2004, Sinking Ship has created and produced numerous children’s TV series and has been on the forefront of TV production and interactive media for kids. From being selected as one of the first partners of Amazon Studios with the upcoming series “Annedroids” to achieving Nick Jr.’s highest debut of all time with the action-packed series “Dino Dan,” Sinking Ship Entertainment brings dynamic content to audiences around the world with shows broadcast in more than 130 countries. Other series highlights include the award-winning “This is Daniel Cook,” “This is Emily Yeung” and “Are We There Yet? : World Adventure.” Find out more at www.sinkingship.ca.